Through the Veterans’ Employment and Training Service (VETS) website you can access job search help, compliance assistance and more. Job search help – Search for jobs, explore careers and apprenticeships, and find training and one-on-one assistance. You can also connect to a resume builder, as well as a skills translator, which will help you match your military experience to the civilian equivalent. Through the site you can also access a Woman’s Bureau Resources page that will connect you to resources for women in the labor force. Compliance assistance – Obtain information about the Uniformed Services Employment and Reemployment Rights Act (USERRA) which protects the employment rights of veterans and prohibits discrimination. Support for military spouse employment – VETS supports a variety of programs for veterans and their spouses. Visit this page to access a range of helpful career information resources including the Workforce Innovation and Opportunity Act Desk Reference for Military Spouses. Veterans Hiring Toolkit – This step-by-step toolkit for employers helps companies develop or enhance a veterans hiring initiative. Women Veteran Program information – The Women Veteran Program monitors the employment situation of women veterans. Download factsheets, webinars and more. 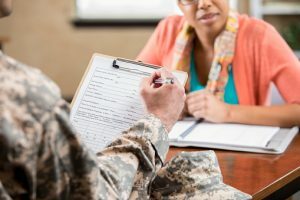 Frequently asked questions – Get answers to questions about military to civilian employment, job rights, policies, programs for veterans with a service-connected disability, and more. VETS Regional Office listing – For in-person assistance, visit a regional office. VETS has offices in every state. Veterans are natural leaders and have a strong work ethic. As a member of the military, you have a range of skills and qualities that civilian employers value. Omni Financial, for example, is one of many companies that understands how much veterans have to offer. Veterans are natural leaders and have a strong work ethic. They possess knowledge that sets them apart from other job candidates and makes them uniquely qualified for many positions. Even if it takes some time to find your perfect job fit, stay positive and keep working toward your career goals. Good luck!